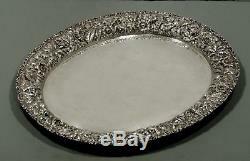 STIEFF STERLING SILVER TEA TRAY 1928 HAND CHASED NO MONOGRAM. 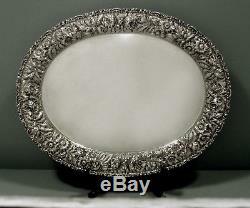 This is a 1928 Stieff sterling silver oval serving tray. 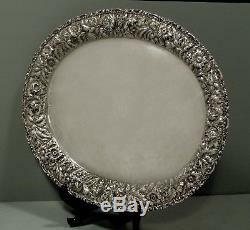 Oval form with delicately cast and chased leaf flower and vine rim. Followed by beautifully hand decorated leaf and floral sprays. Set in exceptionally high relief above satin background surface. Much like the Baltimore rose pattern. 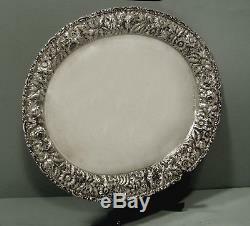 This fine hand decorated 1928 Stieff tray is 16 1/4 inches by 13 inches and. 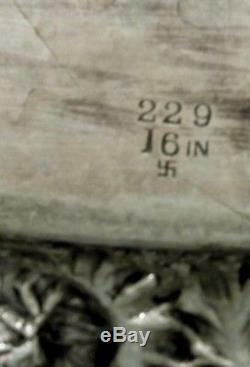 The tray was never monogrammed. Retains original hand chased detail. 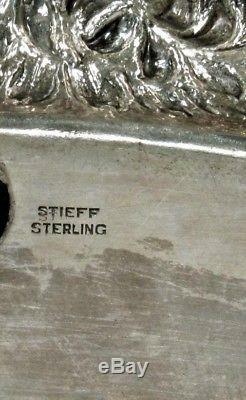 The item "Stieff Sterling Tea Set Tray 1928 HAND DECORATED NO MONOGRAM" is in sale since Friday, September 7, 2018.